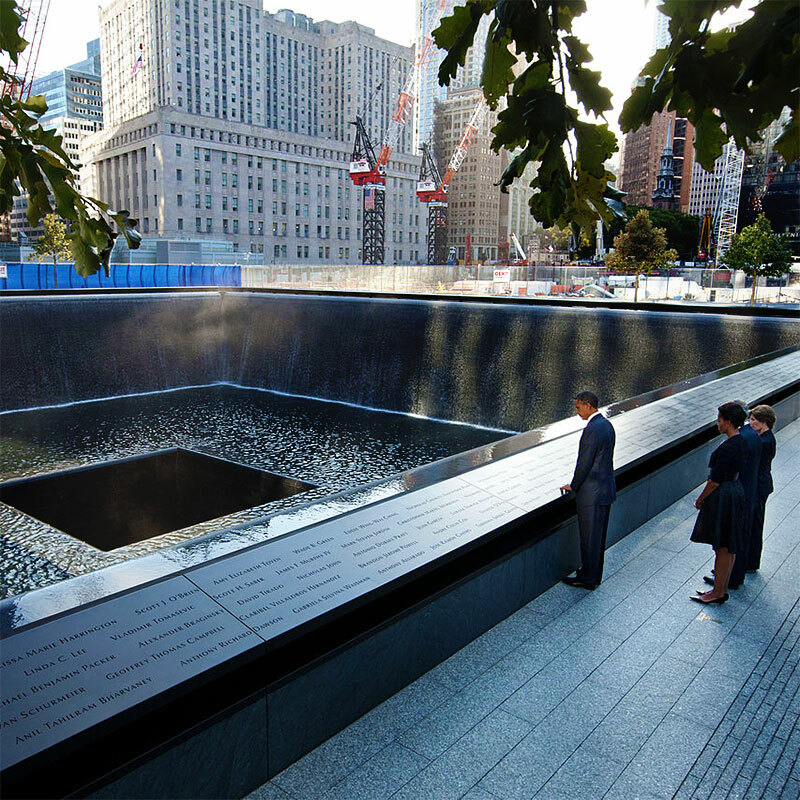 A full 12 years and 249 days after the tragedy that redefined America, president Barack Obama dedicated the National September 11 Memorial & Museum in New York today, telling attendees that "nothing can change who we are as Americans." “Here, at this memorial, this museum, we come together,” the president told a crowd that included former New York mayor Michael R. Bloomberg, current mayor Bill de Blasio, former Mayor Rudolph W. Giuliani, governor Andrew M. Cuomo, and embattled New Jersey governor Chris Christie. The crowd also included survivors, victims' families, and first responders. Located at the World Trade Center site, on the former location of the Twin Towers, the museum building is designed to evoke a partially collapsed building. Two of the original "tridents," important structural components of the original towers, are located in this pavilion. One of the walls of the underground museum is an exposed side of the "slurry wall," the retaining wall that holds back the Hudson River. Other artifacts from Ground Zero include wrecked emergency vehicles, including a fire engine bent out of shape from the collapse; pieces of metal from all seven World Trade Center buildings; recordings of survivors and first responders including 911 phone calls; pictures of all the victims and photographs of the wreckage; and other exhibits detailing the destruction including the plane crashes, collapses, fires, jumpers, and clean-up. The memorial itself has been open since September 12th, 2011, but the museum formally opens its doors to the public this May 21st. There has been controversy surrounding the project, even apart from the lengthy delays and cost overruns that have plagued the reconstruction of the site and the creation of the memorial and the "Freedom Tower" at One World Trade Center. Curators have declined to mention the existence of the ruins of a Lebanese Maronite church found in the rubble; Arab-American groups want the archaeological find mentioned to emphasize Arab involvement in the history and community of the Little Syria neighborhood that encompasses the Ground Zero site. Also, museum ticket prices are $24, which is high even for Manhattan; Bloomberg told citizens who complained about the price to "call your congressman."